Call center management is both Arts and Sciences. While driving moral and setting up strategies is more about Arts, staffing and servicing level configuration based on call load is in the domain of Sciences. The science part of call center management is based on Queueing Theory, which studies "the Phenomena of standing, waiting and serving" , .The queueing model abstracts the complex phenomena of call center acticities into an idealized mathematical framework, so that it is possible to study the key characteristics and dynamics of the real world. There are many different models that could be applied to Call Center management, one simple yet popular model is called Erlang-C model. Some other highly related models are Erlang-B and Erlang-A models, but they won't be covered in this post. In this article, Erlang-C model will be briefly described and the computation of key parameters of this model will be discussed, followed by a complete suite of SAS code pieces. It is interesting that Erlang-C model is rarely touched in the SAS community. Searching through SAS-L archives, there were only two discussions relevant, and they are set apart by 10 years ,  ! The responders includes legendary David Cassell, SAS guru Daniel J. Nordlund, SAS computing expert Rick Wicklin (his SAS blog), and of course me. Erlang-C model is a commonly used mathematical framework for many Call center staffing and management softwares. Based on Kendall notation, this model can be expressed as M/M/C/\inf, where the first M indicates a Poisson distribution for Arrival process, while the second M indicates an Exponential distribution for servicing time. Both 'M' refers markovian the 'C' indicates number of servers which is a non-negative integer, while the last \inf refers infinite number of places in the system. Erlang-C system has extra assumption that it is First In First Out (FIFO) with infinite calling population. Therefore, Erlang-C model describe a Call Center that serves customers in the order they arrive in, while customers arrives following a Poisson process and the servicing time is Exponentially distributed. When a customer is not immediately served, it is put on hold until next available server (CSR). The customers are assumed to be patient so that they won't drop out but instead wait how-long-it-takes until next CSR. The system can take infinite number of waiting customers. In Erlang-C model, the traffic to a Call Center is measured in a so-called term of Offered Traffic Load, which is defined to be the ratio between the parameter \lambda of Poisson process and the parameter \mu of Exponential servicing time. Offered Traffic Load is therefore interpreted as the average number of services that are trying to happen simultaneously. It is free of time unit, but does has its own unit, called Erlangs. At the core of Erlang-C model is the Erlang-C function. The Erlang C function computes the probability that an arriving customer in the Erlang C queueing model will find that all servers are busy. This is the same as the fraction of arriving customers that are delayed (i.e., must wait) before beginning service. where dPoisson(n, x) is the density function of Poisson distribution with support 0,1, .., n and shape parameter x. pPoisson(n, x) is the corresponding cumulation distribution. 1. Function ErlcFractionDelay(Nsrv, traffErlang) calculates Probability of delay given number of servers and offered traffic Load in Erlangs units. 2. Function ErlcNsrv(traffErlang, Erlc_max) estimates the minimum number servers to reach below the max probability of delay given by Erlc_max for a given offered traffic load of traffErlang. 3. Function ErlcTrafFromFractionDelay(Nsrv, fractionDelay) Compute the max traffic load that Nserv servers can handle with queuing probability less or equal to fractionDelay. In addition to the three key numbers in Erlang-C model, there are some other paremeters of particular interests to Call Center management. For example, the probability an arriving call will be put in queue for no more than certain waiting time given the average handling time. Function ErlcGoS(Nsrv, traffErlang, AHT, AWT) will calcualte this quantity. The results of this set of functions has been calibrated against the data from , specifically Table 1. of  is reproduced exactly. 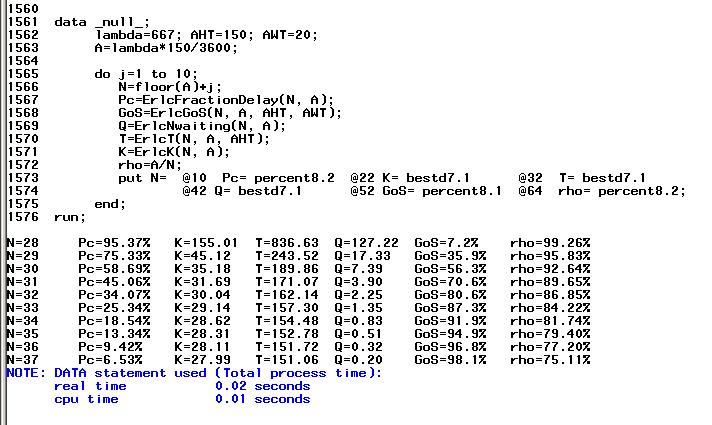 The DATA STEP at the end of the program below will reproduce the results, and here is the result my own run. For a complete list of quantities that Erlang-C model will work with and compute for, the webpage of Abstract Micro Systems @ http://abstractmicro.com/erlang/helppages/mod-c.htm provides a very good introduction.
. Kleinrock, Leonard (January 1975). Queueing Systems: Volume I – Theory. New York: Wiley Interscience. ISBN 978-0471491101.
. Kleinrock, Leonard (April 1976). Queueing Systems: Volume II – Computer Applications. New York: Wiley Interscience. ISBN 978-0471491118. All functions below have relatively detailed comments. The functions are provided as is without any implied and explicated warranties, and are for research purpose only.